The shrubs I received were in good shape. The shrubs look like they doing good. This uncommonly beautiful shrub with its unusual flowers goes by several names, including Sweet Betsy, Sweet Bubby for its intoxicatingly fragrant flowers. It’s also called Carolina allspice for the taste of its wood. Sweetshrub is native to the upper regions of South Carolina. A well cared for Sweet Shrub grows one to two feet a year. Sweetshrub has opposite leaves that are about 6 inches long and half as wide. The tops of the leaves are a deep, glossy green while the undersides are pale and fuzzy. The Sweet Shrub is grown as much for its foliage as its spectacular flowers. The Sweet Shrub leaves give off a lovely aroma when they’re crushed and turn golden in the fall. 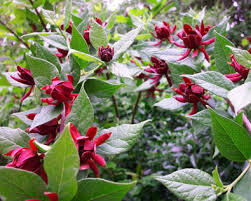 Sweet Shrub's fragrance and its habit encourage people to plant sweet shrub around patios, beside doors and other places where the family and their guests congregate. The Sweet Shrub also joins groups of native plants in the garden and is found in borders. The flowers resemble those of the magnolia, but they are brown or brownish red, though there are cultivars with greenish-white flowers. Sweet Shrub aroma is wildly fruity, and they blossom at the ends of the shrub’s branches from spring to mid-summer. Ideally, the Sweet Shrub should be pruned immediately after the flowers are gone to help it keep its shape. If the flowers are allowed to persist on the tree, they’re followed by seed capsules that cling to the tree throughout the winter. Sweet shrub’s flowers not only have an unusual color but they last an unusually long time and are favorites for flower arrangements. They retain their fragrance when they’re dried, and are added to potpourri. Sweet Shrub grows six to nine foot tall and a spread of six to twelve feet wide.